AAA projects 2.25 million New Englanders will journey 50 miles or more away from home this Thanksgiving, a 3.5 percent increase over last year. The 2017 holiday weekend will see the highest Thanksgiving travel volume since 2005. Nationally we are projecting that 50.9 million Americans will travel. AAA and INRIX, a global transportation analytics company, predict travel times in the most congested cities in the U.S. during the holiday week could be as much as three times longer than the optimal trip. AAA projects 2.25 million New Englanders will travel this Thanksgiving an increase of 3.5 percent. 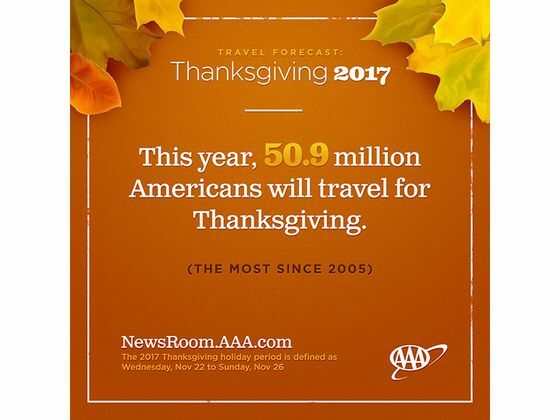 This is the highest Thanksgiving travel forecasted since 2005. Holiday air travel is expected to increase 5.4 percent to 249,00 leisure travelers. INRIX to provide local traffic predictions for the 10 worst traffic hotspots, best and worst times to leave in the 10 busiest metros, and travel times for the top 10 busiest airports into this year’s Thanksgiving travel forecast. This data will be available on Friday, November 10 and an updated press release will be sent to clubs.